Hardened special alloy 3/8" shackle. 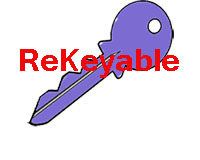 Can be configured at key retaining or non-key retaining. Currently available in Schlage C® and Kwikset®. Abus has long been a favorite of locksmiths worldwide. Not surprising, since they are precision made. The operation of the 83/50 is smooth as silk and we can key it to match your Schlage or Kwikset house key. Other keyways are available by special order.